The ability to quickly find duplicate items in iTunes libraries is back in the latest version of iTunes 11 for both Mac OS X and Windows. First things first, you’ll need to update to iTunes 11.0.1 before attempting to use the feature again. Update to the newest version either through iTunes itself, or through Software Update, or the Mac App Store. Then you can find duplicates again. Simple enough right? There’s a couple important things to note here: both items are shown, meaning both a song and it’s duplicate version, so you don’t want to simply just delete everything you see in the updated iTunes window or you will remove both the duplicate and the original. If you’re trying to thin out songs you know are copied throughout the library, take the time to review the files shown to make sure you are deleting the correct version, whether it’s of lower bit rate, mislabeled, or whatever else. Also, the duplicates shown at the time will depend on the media library selected. Most people use this feature to find and remove duplicate songs rather than movies or podcasts though, so that shouldn’t be an issue. Finally, if you’re coming from past versions of iTunes that had this feature too, make note of the switch where this option now resides in the “View” menu rather than the “File” menu like it did before. 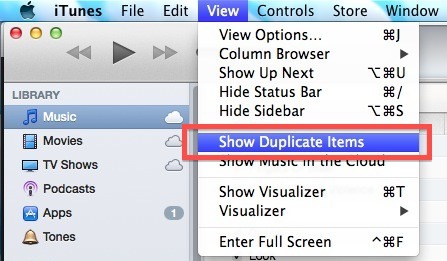 The “Show Exact Duplicates” feature is still around as well, accessible by holding the Option key. Other than preventing repetitive music playing, this can be another effective way to clear up some free disk space when you’re hard drive is running low. For some background, this feature has been around for quite a while, but it briefly disappeared from the first iTunes 11 release before coming back with the iTunes 11.0.1 update. Presumably it will carry forward with future versions of iTunes. I noticed some files showed up as duplicates of themselves (w/ different play stats). I assume this is an iTunes internal database error? This option isn’t even present in my installation of iTunes 11. Go figure. View has now “view duplicates”. 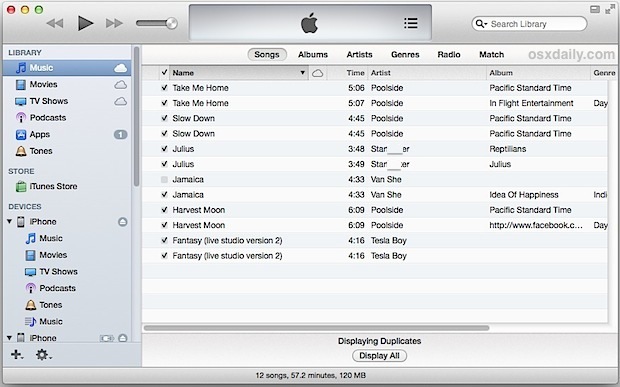 this is not showing on my iTunes v 12.4.e3 – did iTunes remove it again? I updated as advised, but the Show Duplicates Item is grayed out and is unselectable. All this seems to do is check for the same name and artist. I have some audio recordings all with the same name and artist but wildly differing lengths (14:20 vs. 2:55:10) and they are reported as duplicates. Not very well done at all. You have to press the ALT-key to chnage the menu entry to something like Show exact duplicates. That one is more accurate.